Here's a link to our local weather. Book Online directly with us, we 100% guarantee that this is the very best rate you can get, anywhere. Of call us at 775.265.3181 for a tee time, we would love to hear from you. Remember we are just a quick hop, skip & jump from South Lake Tahoe ! Since 1965 Carson Valley Golf Course has been home to affordable, friendly golf. The cool rush of the Carson River and the shade from our giant cottonwood trees, give our golf course a very unique character. Our goal is to make golf fun! We have plenty of space for our serious golfers, but we want to make sure that you have a good time while you are here and leave with a smile on your face. 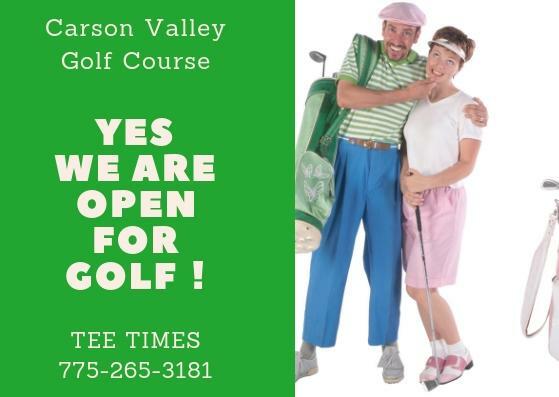 Book your tee time at Carson Valley Golf Course Today! View info on our Junior Golf Passes and sign up for our 6 week Spring Junior Golf Clinic. Family golf at Carson Valley Golf Course ~ where we are committed to making golf fun & affordable for everyone!